The Islands of Tahiti conjure visions of sparkling lagoons and iconic over-water bungalows. But divers know that there's another side to this tropical paradise seen only to those who slip below the surface. Yes, there are coral reefs and sand-bottom lagoons that harbor clouds of colorful tropical fish, but the big attraction for divers—literally—are the numerous chances for encounters with sharks and marine mammals. These include swims with whales and dolphins in blue water, exciting drifts though passes where reef sharks gather by the hundreds, and laid-back swims in coral-rimmed lagoons filled with stingrays, lemon sharks and more. 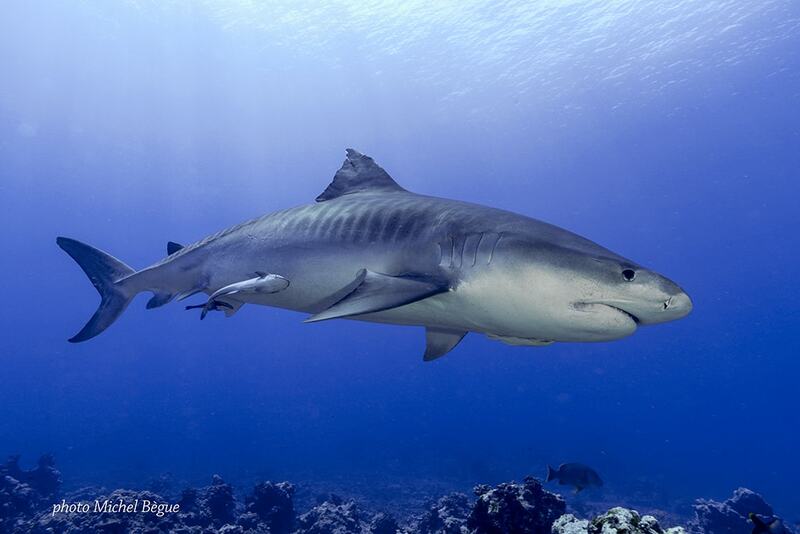 The Islands of Tahiti is one of the few places in the world where divers can reliably come face to face with tiger sharks. 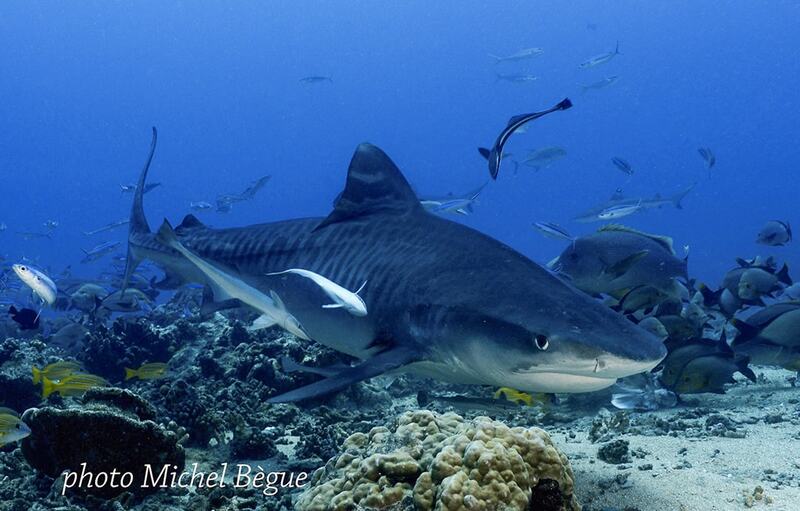 Tahiti is also one of a few places in the world where divers can reliably meet up with tiger sharks. This adventure takes place on the big island of Tahiti and is offered through Fluid Dive Center. The center's Tiger Shark Experience is an all-day excursion done in partnership with the Polynesian Sharks Observation program. Trips begin with a detailed briefing on the sharks by a naturalist guide and are staged aboard a staged aboard a fast outboard-powered launch configured to accommodate a limited number of divers with shaded lounge-like seating. 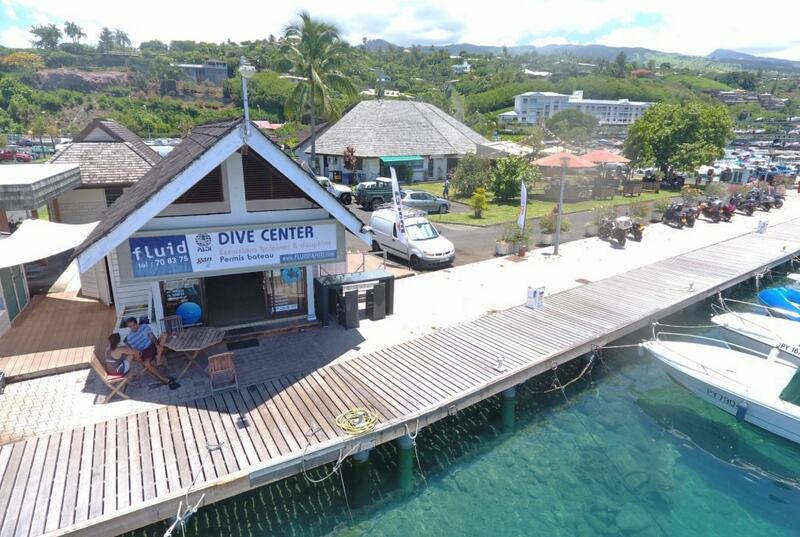 Fluid Dive Center is the starting point for tiger shark encounters and also offers whale and dolphin swims. Divers are brought to a site known as White Valley, which is a 100-yard-long submerged sandbar ringed by coral heads. This site is rich in marine life, and the water is often filled with swirling schools of jacks, fusiliers and snapper. Once divers settle in on the sand bottom, the bait box arrives and with it come the sharks. First to arrive are usually the locals—nurse sharks, whitetip and blacktip reefs. Soon, sleek lemon sharks cruise in, and as activity continues to increase a group of gray reef sharks gather in anticipation of a snack. 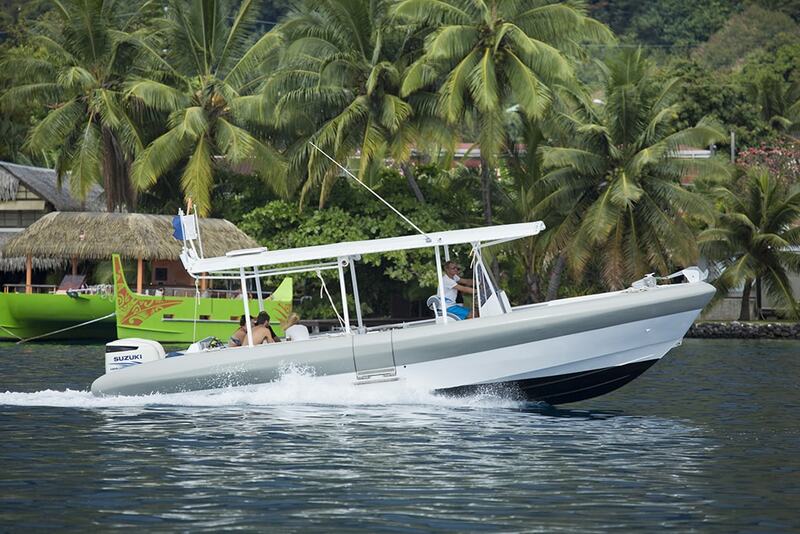 Fluid's Zebubbles lunch provides fast, comfortable transport to dive sites. 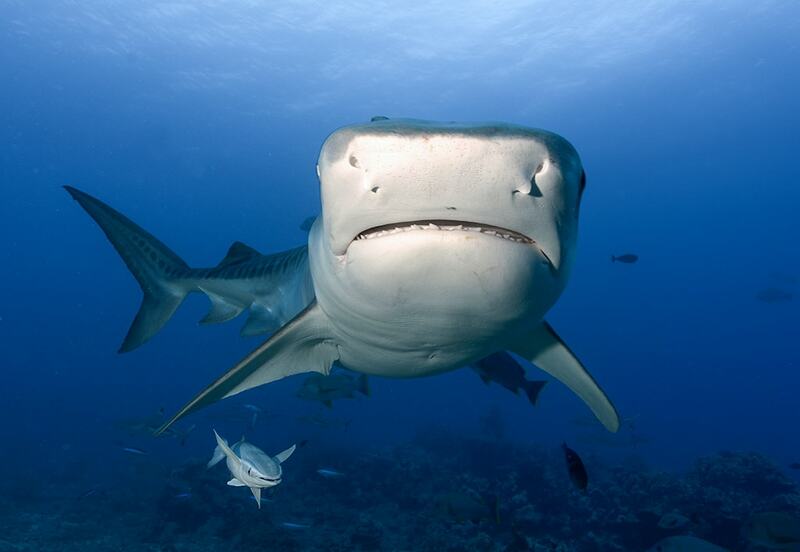 Typically, last to arrive are the stars of the show, the tiger sharks. Growing to lengths of 12 feet, and weighing in at a thousand pounds or more, these apex predators quickly become the dominant animals at the feed—and the center of attention. After the first encounter, lunch is served and divers are given time to relax and review their photos and video before beginning the second dive of the day. On both of these dives, it's not uncommon to be surrounded by three to four dozen sharks during, and as many as a half dozen tigers may be in attendance. A tiger shark approaches the dive site known as White Valley. Tiger shark encounters are one of Fluid Dive's headline attractions, but there are a number of additional sites to discover around the island of Tahiti, ranging from novice-friendly shallow sites to wreck sites and drift dives along sloping walls. Some divers may choose to plan their entire vacation on the big island of Tahiti, which is home to the international airport at Papeete, which is the gateway to all the islands of Tahiti. Tigers can grow to lengths of 10 to 12 feet. These adventures are also available as add-ons before or after inter-island transfers to islands such as Bora Bora, Moorea or the atolls. We work with Fluid Dive Center to create packages that showcase the best of Tahiti, above and below the water. To learn more, give us a call at 800-330-6611 or send a note to sales@caradonna.com.